The Monastery of the 10,000 Buddhas (also known as the Temple of the 10,000 Buddhas) is one of the best attractions Hong Kong has to offer. 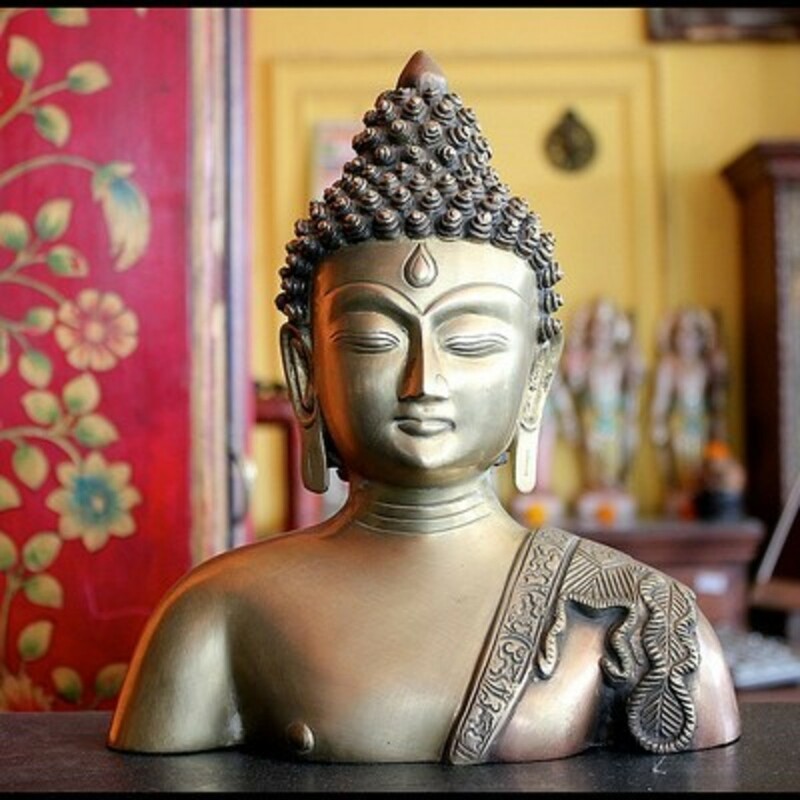 It is a truly unique experience, unlike anything else you will see in Asia and truly not to be missed. Despite its uniqueness, it is relatively unknown. The building of the Monastery of the 10,000 Buddhas began in 1949, founded by Yeut Kai, and it took eight years to complete. 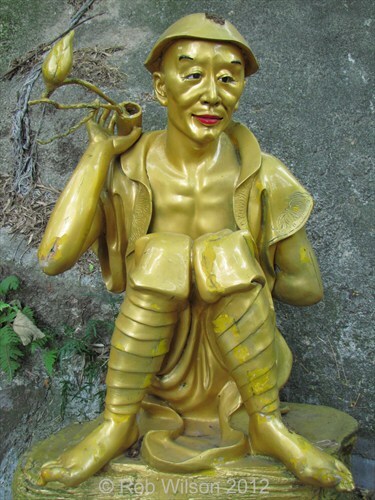 Yeut Kai died in 1965; his preserved remains were coated with Chinese lacquer and gold leaves and were then placed on the altar in the main temple on the lower level. A rebuilding of a number of temples was started in 1982 including the Kwun Yam Pavilion and the 18 Arhan Verandas. 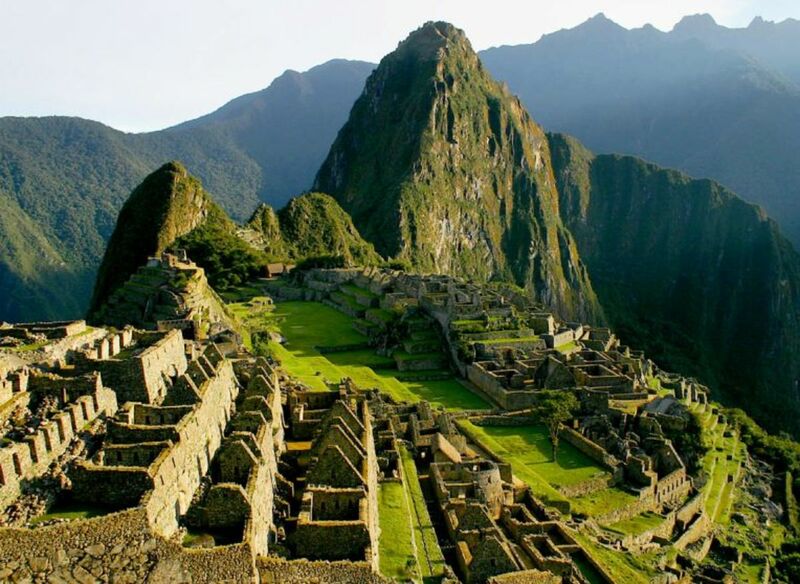 Sadly, in 1997 a landslide destroyed or damaged a large number of buildings (those in the upper complex were particularly badly damaged). Work to restore those buildings is still ongoing today. The Monastery no longer houses monks and is in fact now run by laymen. 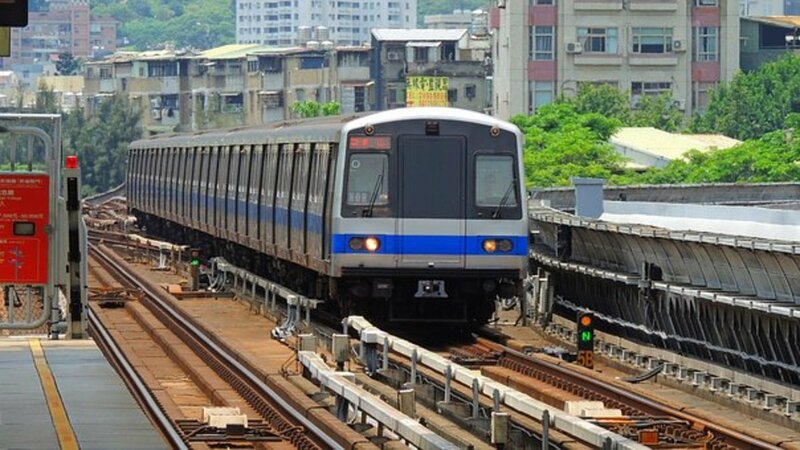 It is located in Sha Tin; the best way to get there is on the MTR. Hong Kong’s MTR system is quick, reliable and cheap and most importantly in the summer, air conditioned. Pick up some water as the climb can be strenuous (in the heat of a Hong Kong summer, even short walks can be challenging). Also grab some sunscreen and bug spray. The Monastery itself is free, although donations are always welcome. 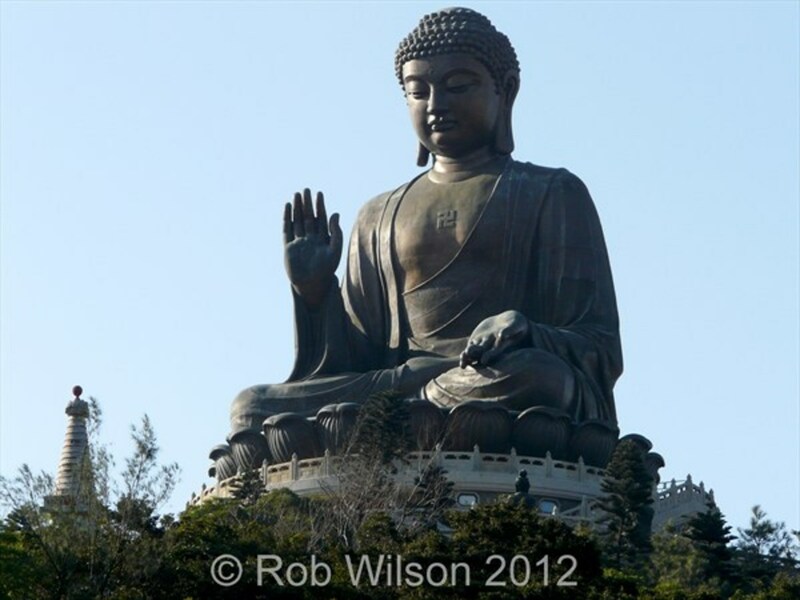 The Monastry is located in Sha Tin; the best way to get there is on the MTR. 1. Upon disembarking at Sha Tin MTR station, go out of Exit B. 3. Continue on down the path until you see the Grand Central Plaza / Home Square building directly across the road ahead of you. 4. Turn left onto Pai Tau Street (Grand Central Plaza will now be on your right). 5. On your left you will see an outdoor football (soccer) pitch, turn left immediately after the soccer pitch down the path again to your left. 6. You will reach an intersection, there will be a gently sloping path directly ahead, walk up that path and follow it. You will start to see signs advertising the Monastery of the 10,000 Buddha’s (you should see a white and red sign pointing the way at the intersection). 8. You will see a path leading up a steep hill between some houses; you are pretty much there (continue to follow the yellow signs which will guide you up the hill). Once you walk past the last few houses, you will begin a 431-step climb towards the Monastery itself. 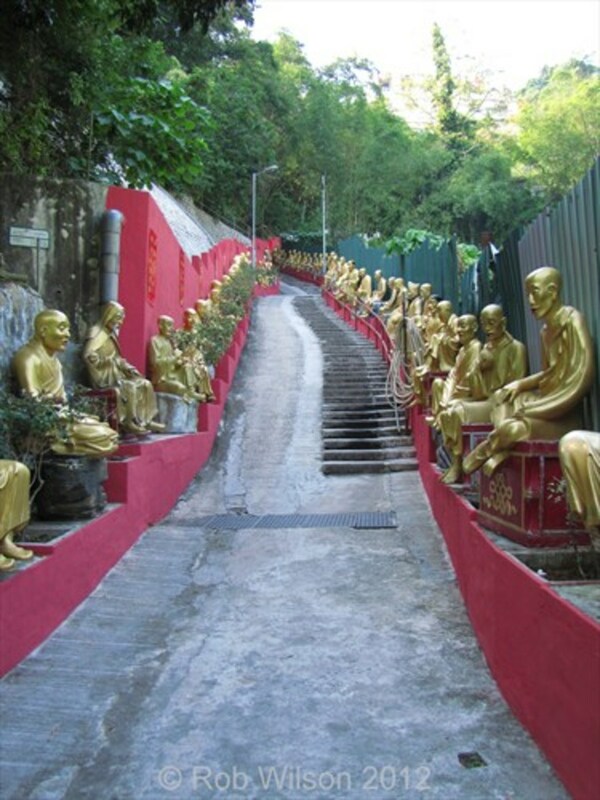 The walk up to the Monastery is worthwhile all on its own as you will pass by ranks of large gold painted plastic statues. 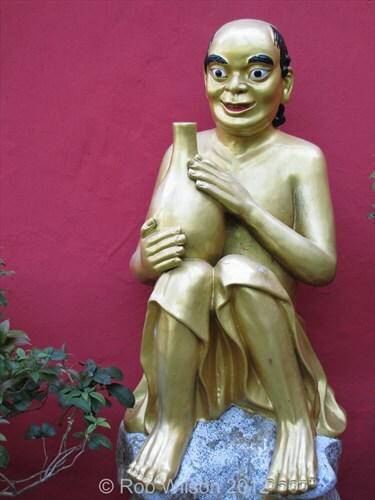 These statues are all different and many are quite striking and unusual. Depending on your imagination, you will may be able to spot any number of “characters” amongst the large number of statues. My personal favourites are “The Scream” and the “Thank God it’s Friday” statue. 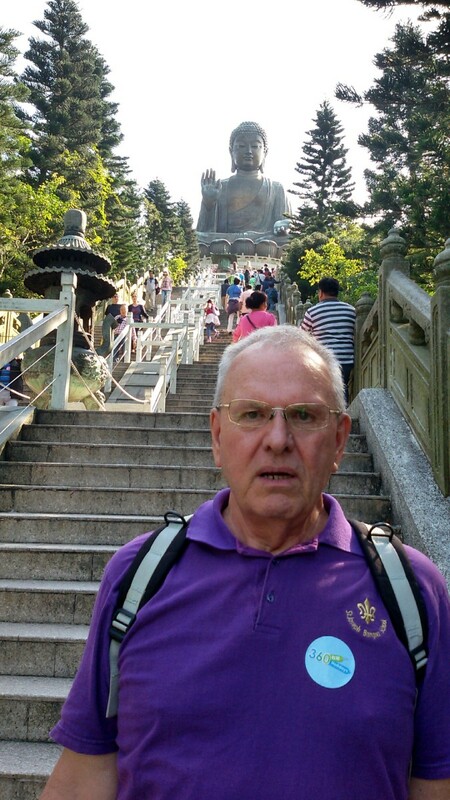 When you finally arrive at the summit the nine story Pagoda is immediately in front of you. Feel free to climb the stairs inside the pagoda to the top. 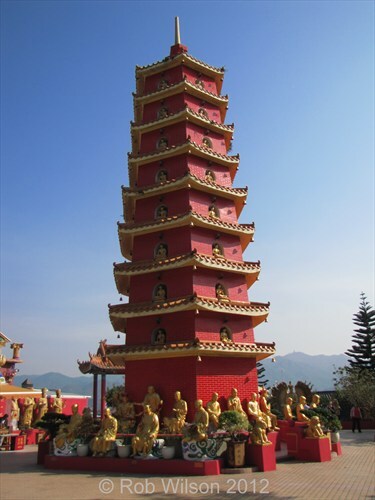 The inside of the pagoda is painted white, with Buddha statues in each window and also on a red plinth at each landing. The statues rather obscure the views from the windows, although you can still see the view from the lower windows on the top level). The main temple is set at the back of the lower level, with two enormous gold dragons facing each other adorning the front of the temple above the entrance. Inside the main temple are 12,800 gilded ceramic Buddha statuettes covering all of the interior walls. The effect of all those statues is very striking and rather mesmerising. At the front of the lower level, you will find some large statues, one of a Buddha riding a big blue dog, the other a Buddha riding an elephant. There are a number of out buildings, housing more statues as well as a temple. The statues in the out buildings are more ornate than those permanently housed outside. There is also a large gold incense burner, complete with dragons. 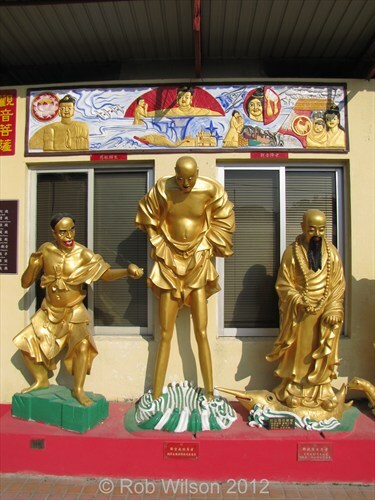 69 more steps and you are able to visit the Temple of the God of Heaven, the Candi Buddha Temple, Kwun Yam Temple and the Temple of the Nei Tor (Amita) Buddha. There is also a beautiful white statue in front of a man made waterfall (not working at this time). 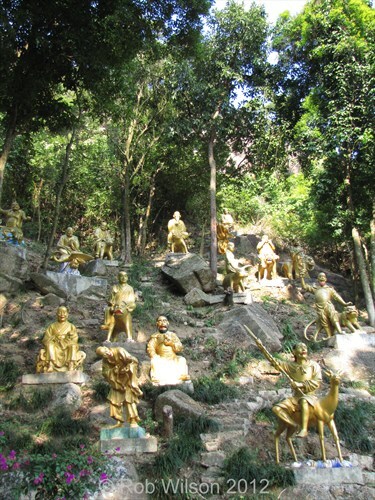 Nearby this statue are another grouping of the large gold statues arranged on the hillside. 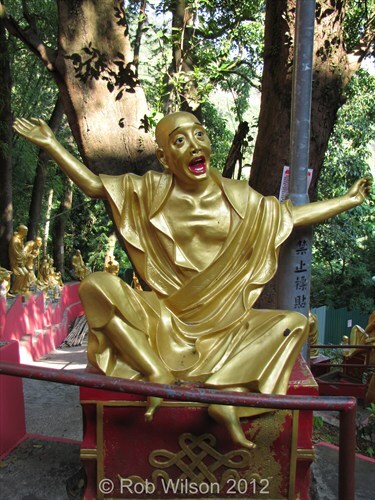 I do hope you enjoyed your visit to the Monastery of the 10,000 Buddha’s. It is one of my favourite places in Hong Kong. It is a truly unique Monastery, unlike anything else I have seen in Asia. Please feel free to leave any comments you wish below. 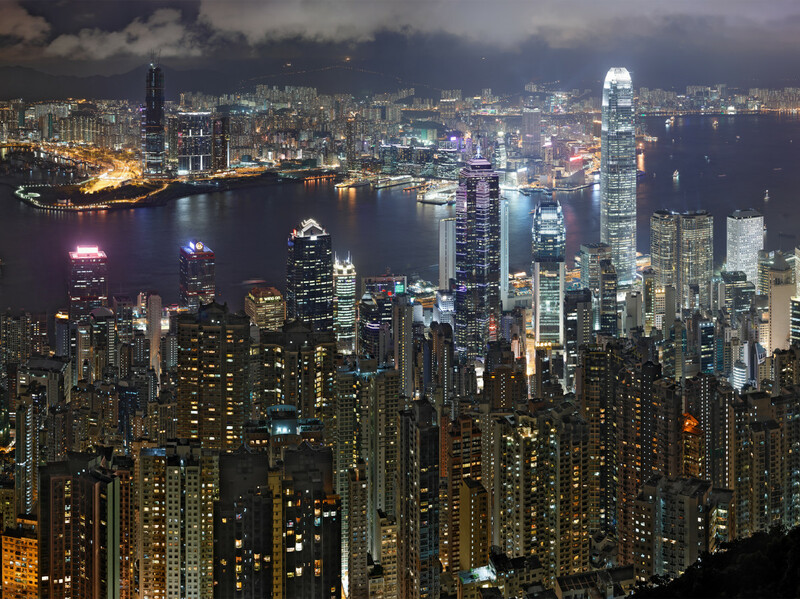 Which of Hong Kong's tourist attractions have you visited (or will you visit)? Thank you so much for your comment, you are too kind. 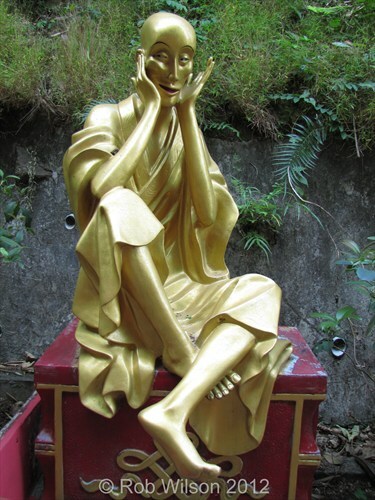 The Monastery of the 10,000 Buddhas is one of my favourite places in Hong Kong (in fact in Asia) and I am so glad that you liked my hub on it. I was lucky enough to work a short distance from it in Sha Tin for 18 months and used to often go there for some peace and quiet in my lunch break. 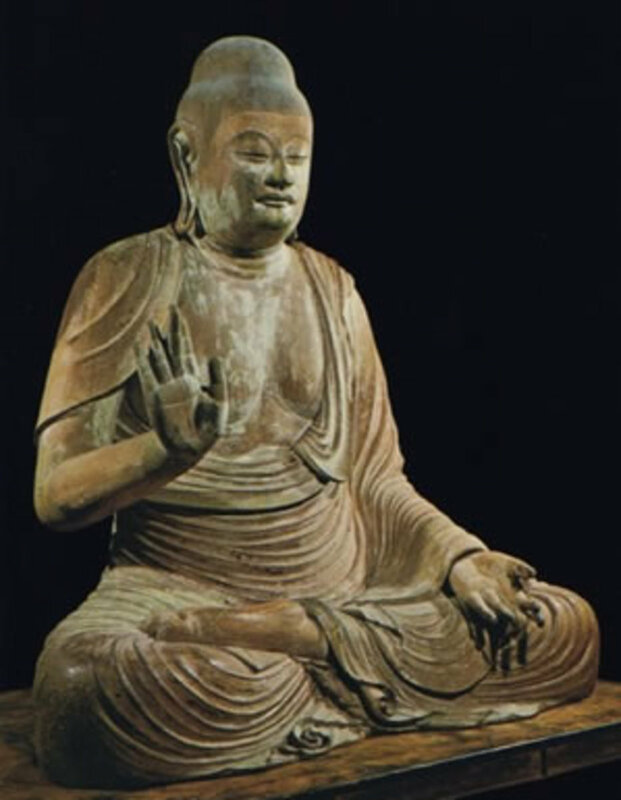 It is certainly hard to believe that, with many Americans now studying Buddhism and others interested in things Buddhist, no one here or abroad has commented on this outstanding effort to provide information on this unique site. I am also impressed by your many fine articles on computer science. Thanks for commenting on my recent Hub Community question about older Hubs. That led me to your Hubs.